GIVEAWAY: Enter to win a year of PC Matic with a $50 Amazon.com gift card for you and one to give to a friend (Ends 7/19/13 at 11:59 PM EST) | A Savings WOW! 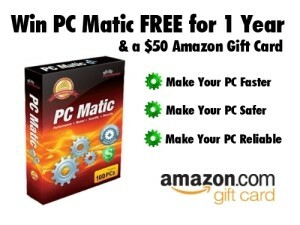 Grand Prize: A year of PC Matic with $50 Amazon.com gift card for you and one to give to a friend! PC Matic is a safe, secure, and simple to use software that automates the regular maintenance and preventative steps necessary to keep your PC fast and safe. PC Matic will save you time, money and the aggravation of dealing with a PC that is infected with malware and operating at a fraction of its original speed. PC Matic can be set to automatically operate quietly in the background. The giveaway will open up on 7/16 12:01 am EST and close on 7/19 at 11:59 pm EST.